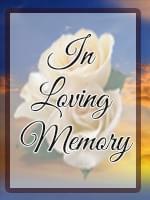 Yvonne Joyce Fish, 80, passed away on December 26, 2014 in Scottsdale, Arizona. She was born on December 20, 1934 in Viroqua, Wisconsin. She is survived by her children, Steven Fish, Mark Fish, Phil Fish, Ellen Garcia; 14 grandchildren and 1 great grandchild. We loved Yvonne and Ron and were always impressed with their kind and generous spirit. We know it was hard for her to keep on since his passing, but the Lord gave her grace in the hours of need. We will miss her and know that her example and love have touched her family and so many of us who were her friends and had the opportunity to share a little part of her life. May our gracious Lord, the God of all Comfort, bless you with wonderful memories and help in the days to come. Ron and Yvonne were great friends that we met at Tri City Baptist Church. They were an example of love for their Lord, family and friends. We will surely miss her and have fond memories of her and Ron. Our love and prayers to all the family. Yvonne was one of the most beautiful people I have ever had the privilege to pastor. Her love for the Lord and her sweet spirit simply were wonderful! I can’t imagine what the celebration was like in heaven when she stepped ashore to see her Savior and her Ron. All the pain is gone and the hurt. We miss her, but Ron is bursting with joy that his bride is with him again. Our sorrow is with all of you, but our weeping is just for a season. Our joy will be for eternity! Bless her heart, I know she is rejoicing with Ron and many others around the Throne. Yvonne was a sweet friend to me when I first came to Tri City many years ago. She and Ron knew that I was a Pillsbury grad and we chatted and talked college often. They were both wonderful examples of Godly servants that never “blew their own horn”, but just were always involved in ministry of some kind. My prayers and condolences go the family. God is good! Yvonne always had a sweet smile and uplifting comments when I talked with her. She and her husband Ron were such great testimonies of faithfulness. They left an incredible influence on those who knew them. Could we but pray for more committed, godly saints such as Ron and Yvonne! May God comfort you at this time and may you rejoice that they are only a blink away! The first memory I have of ‘Grandma Fish’ is sitting in the rocking chairs in the nursery watching babies. I loved to talk with her and found out that we had Pillsbury Baptist Bible College in Owatonna, MN in common. Grandma Fish was such a godly example to me. I’m glad I get to see her again someday. Thinking of all of you and praying for God’s comfort for you. Your mom and I shared some special times, and when your dad was alive, we all spent many an hour in doctor’s offices but always enjoying each other’s company. What comfort we have that we will see them again. God bless you all with joyous memories.